What a way to start my 2014 here at Mommy Practicality. 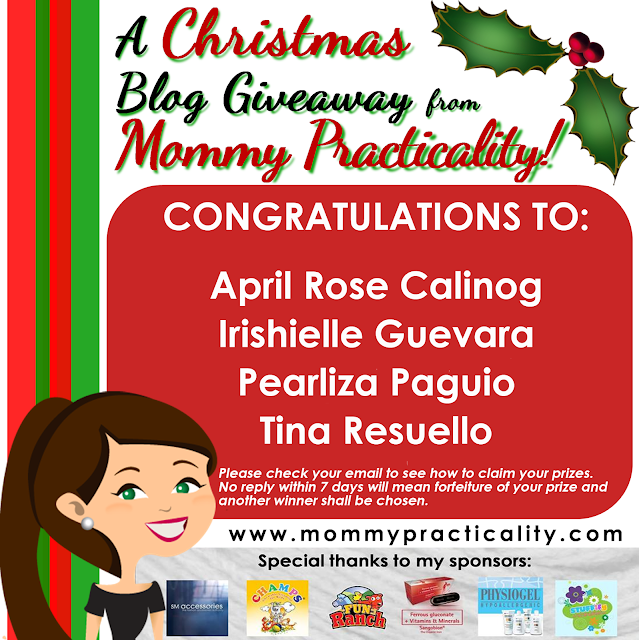 The very first blog post will announce the winners to the recently concluded Mommy Practicality Christmas Giveaway! Baka suwertehin din ako because bongga ang first post, WINNERS agad! First of all, HAPPY NEW YEAR to all of you my dear readers, followers and online friends! I can't thank you all enough for your support from the time I started up until now. I will be turning two this year and I have a lot of other plans for my humble blog. Plans to be able to reach more and inspire more women and practical moms as well. My heartfelt thank you message could also be found HERE. Thanks so much once again to everyone who joined! Until our next bonggang giveaway! Happy New Year everyone! Yey thank you! Happy New Year! Congrats to the winners and Happy New Year, Mommy Louise. Wow, I won.. i was really surprised, just visited your page today because our home connection just got fixed from troubles.. Anyways, thank you so much Ms. Louise..:) so happy po talaga. I'll be waiting for your email po.